Extended Families! There are 6 subspecies of brown pelicans, all similar in appearance, but differing in their geographical distribution. Keen sight! 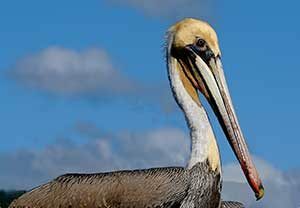 Brown Pelicans can spot fish from 20-60 feet above the ocean surface. Their neck pouch can hold 3 gallons of water ~ several times more than their stomach and their wingspan reaches over 6 feet! An amazing recovery! Brown pelicans were listed as endangered in 1970 after populations plummeted due in large part to use of the pesticide DDT. Populations have since recovered and brown pelicans were removed from the endangered and threatened species list in 2009. High divers! They dive from up to 30 feet and have air sacs under their skin to soften the fall and bring them back to the surface after the dive.